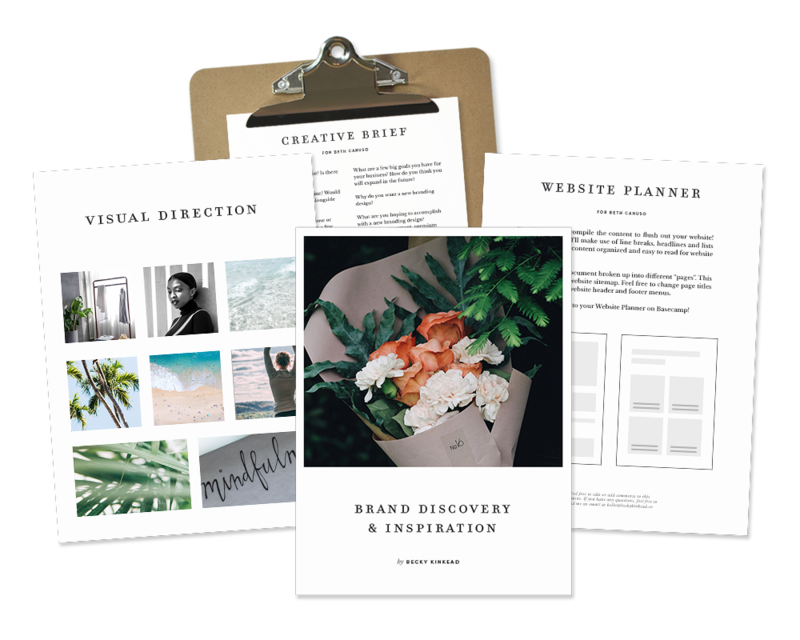 First up is digging into the background of your business with a creative brief, mood board and brand strategy guide. We want to make sure we’re on the right track in terms of style and the overall vision of your project. Your brand sets the tone with website visitors showing who you are, what you're about and the value that you provide. This stage is about logo concepts, color palettes, font combinations, custom icon sets & your brand style guidelines. You're passionate about your business and we want it to flourish across the web. After finalizing your brand design, it's time to put marketing materials together that are aligned with your business goals such as social media banners, business cards and newsletter templates. Now that we have the foundation of your brand ready, it's time to launch a website that sets you apart and establishes you as a leader in your industry. I'll build a strategic website using Squarespace, so it's easy for you to maintain and brings in your dream clients. As we wrap up, I'll send over final files and your brand style guidelines and we'll hop on video and I'll give you a tutorial on how to update and edit your website. Then it's time to launch - cheers! Fully customized Squarespace website design. Brand Strategy Guide. Mood board, color palette, typography combinations. Payments are split into 3 invoices. 50% booking deposit, 25% due at the start of your project and 25% due at project launch. Complete the inquiry form below, this helps me get to know you & your business. After I recieve your inquiry, I'll be in touch to schedule a complimentary call so we can chat about your project goals!